We started the charter trolling with two planners down – one with a pink and blue sea witch in front of a double hooked Bonito strip and the other with a #2 ½ blue reflector drone spoon. As we trolled the reefs, our first strike came on one of the planner rods. Mark reeled in a 9 lb. Kingfish. We kept trolling the area, while the two anglers took turns reeling in their catches. It was time to do some live bait kite fishing so I set out two kites with two live Goggle Eyes from each kite. Mahi Mahi on right short – as Laura reeled in the Mahi, and our mate, Dave, put the fish in the fish box. We reset both kites. Suddenly, a dorsal fin popped up – Hammerhead Shark right long kite! He frantically chased the bait around, and in a split second, we were off to the races. That’s going to be a hell of a fight on a 30 lb. test line!!! The estimated 300 lb. Shark made his initial run. After an hour and 15 minutes battle, Mark brought the Shark along the side of the boat. A great catch on a 30 lb. test line! The 97” Shark was released to fight another day. Congratulations, Mark, a job well done. 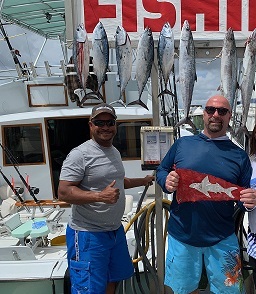 With a total of five Bonitos, four Kingfish, one Mahi Mahi and a Hammerhead Shark, it was now time to head back to the dock. The happy anglers retired into the a/c salon watching the plasma TV and enjoying the relaxing trip back to the dock at Bahia Bar Yachting Center, 801 Seabreeze Blvd. Fort Lauderdale 33316.